It’s a crazy world, isn’t it? 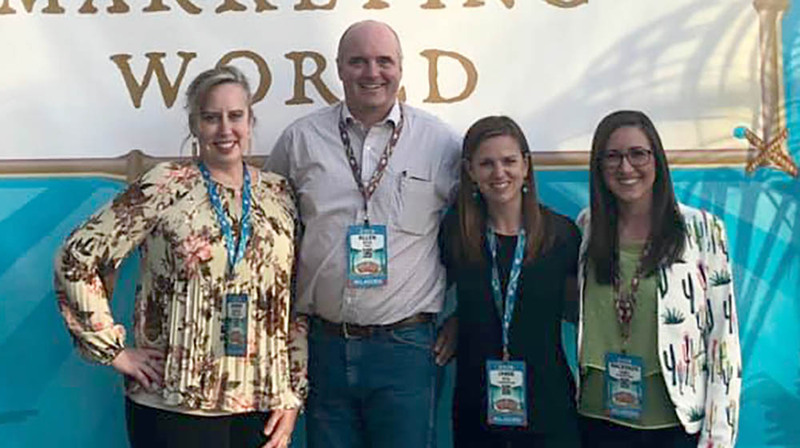 I just got back from attending a fantastic social media marketing conference in southern California last week with a few co-workers. We learned a TON of information, and were joined at the conference with some 6,000 of our best friends…most of who had never heard the term agriculture, much less genetics. I spent my time bobbing back and forth between listening to the speakers and all their wisdom, and straight-up people watching. I’m not afraid to admit it! Y’all, there are a LOT of interesting sights when it comes to 6,000 people from the general public. There was fashion of all shapes and sizes. I saw colored hair, no hair, piercings, tattoos, platform heels, combat boots, glitter, bling, fringes, and one lone cowboy hat. There were people bustling around with their computers in hand, cameras running, phones recording videos of the conference. And then there was the food. This “modern, hip culture” butchered a taco salad like nobody’s business. It just wasn’t right. And to me, tofu is not a protein option, but I was definitely the minority in thinking that way. I did have a girl sitting next to me proudly proclaim that she loves dairy and she drinks her almond milk every morning. Oh boy. We have a long way to go to reach the masses. What I heard a lot of people discussing during lunch and breaks were diet trends. Some were talking about the Paleo diet that includes seafood, meat, nuts, seeds, fruits and vegetables and no dairy (similar to what cavemen ate…for real) while others were boasting of the Keto diet (dairy, meat, low sugar, very low carbs – forcing the body to literally experience ketosis). There were some peeling open their Nutri-System pre-packaged snacks, while others were silently counting points for Weight Watchers. Oh that’s right, it’s now WW instead. The big take-away from that is not which diet people chose, or what food line they stood in during our lunch breaks, or even the fact that people don’t know almond milk is most certainly not dairy. The big take-away is that people are aware of what they’re putting in their mouths and as a result, our culture is more food conscious AND health conscious. Maybe one system sounds good for you at the beginning, but you realize after a week that it’s not a lifelong change in your behavior that you’re willing to make. A loss? Absolutely not. You are automatically more aware of what you’re putting in your mouth, and that’s the first step to making a real dietary change. So how does that relate back to our industry? Awareness. Pure and simple. It doesn’t matter what “program” you are on, as long as you’re aware of what you’re doing, you’ll reach a “healthy state” in your operation and promote lifelong business fitness. Are you the grazer type? You mindlessly eat chips or sweets while watching television? Maybe you’re the grazer type when it comes to selecting bulls and simply say that you’ll just let anyone else pick the bulls for you because it really doesn’t matter. Be aware of what’s going in your herd. Does it promote lifelong business fitness? Or maybe you’re okay with eating those Nutri-System snacks that taste a little better than newspaper, in my opinion. Does that satisfy you? Are you okay with “eating bland snacks” and using those “cheap bulls” in the herd? Does that satisfy you when those animals come fresh and either don’t make it through the first lactation or do but you need a lot of seasoning (or vaccines) to keep their flavor? Maybe you’re a bouncer and like to try a lot of different diets and find yourself hopping from one to another but really never getting the results you want. Have you been bouncing around different A.I. companies and wondering why you’re not making genetic progress? Stick with a program and experiment with ALL the parts of it. For instance, with All West, you have the complete range of business fitness available through our certified A.I. technicians, SMS, SRS and OGP specialists, the industry’s best team of salespeople and the products and bulls that cover every base. You’ll find tremendous genetic success when you rely on the experts and give them the time to produce results you’ll love!